Sweet peas are arguably one of the most beautiful flowers of all. They are extremely popular due to their exquisite petals, shape and stunning fragrance, ranging from delicate to very high scent. Not only do they look stunning, but they are also reasonably easy to grow from seed. 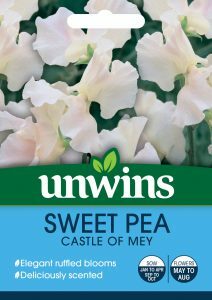 Unwins Seeds have sold Sweet peas since 1903, and currently have about 40 varieties for you to choose from. 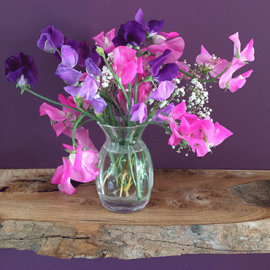 Here is some advice on how to produce the best sweet pea flowers. 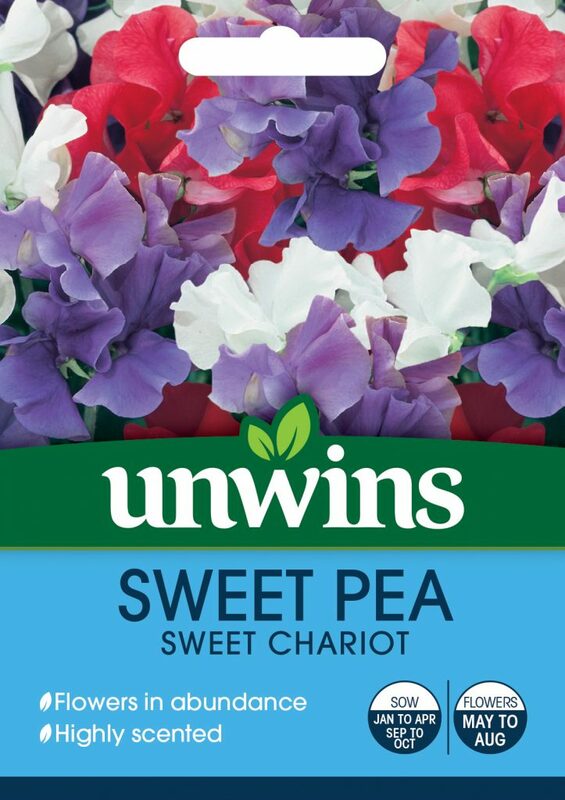 Sweet pea seeds can be sown anytime from October until March. They are grown mainly over the winter because it produces a more robust plant. For an early flush, sow from October to November. For flowers later in the summer, it is best to sow the seed between January and March. 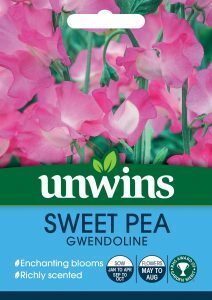 Sweet peas tend to have a hard seed coating which makes it more difficult for them to germinate. To soften the seed coat, simply place the seeds on moist kitchen paper in an airtight container in a warm room. Once they begin to sprout or swell, they can be sown. 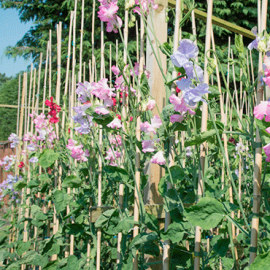 To sow the sweet peas, you will need long, thin pots known as root trainers. Sweet peas like to grow long roots, so deep pots like these are perfect. Fill the root trainer with seed compost. Push the seeds in about 2cm deep and cover with compost. Cover the pots with newspaper or polystyrene. This ensures the moisture and heat is kept in but the light is kept out. The heat will help germination to take place. Germination can happen very quickly so it is advisable to check the seeds every day. As soon as the seedlings appear, the cover can be removed and the seeds need to be kept cool at about 5°C. However, ensure the seedlings are kept sheltered. 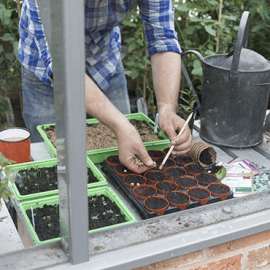 An unheated greenhouse, porch with good light or a cold frame are ideal places to put the seeds at this stage. This cold, but sheltered environment is needed so that root growth is promoted and not stem growth. The plant needs encouragement to grow side shoots so the plant grows out rather than up. Pinching out the growing tip when the plant is about 10cm tall helps to promote bushy growth. Pinching out involves squeezing the growing tip off between your finger and thumb which reduces the plant size. Once all risk of frost has passed and roots have filled the root trainer, it is time to plant them out. It is best to plant them in a sunny, well drained site. Digging in some organic material, such as Farmyard Manure, will help them to retain water. They need some support to grow up such as a tepee structure of canes. Plant two sweet peas at the base of every upright of the tepee structure. Each plant wants to be about 20 to 30 cm apart from each other. If your garden has poor soil, feed the sweet pea plants with a fertiliser, such as potash-rich tomato feed, every couple of weeks. As the sweet pea plants begin to grow, tie them to the frame. This means they will grow stronger and quicker. For the first month, tie them in once a fortnight and then after this it will need to be more regular. Ensure that you water your sweet peas, especially when there is a dry spell. Frequently picking the flowers produces a longer supply of blooms. While picking, if you see any seed pods snip these off. If the plant produces seed, it will stop producing flowers. These 6 simple steps will allow you to have a regular and beautiful supply of sweet pea flowers, which make a great gift or can add stunning decoration to your own home.